For those who think doubting and having questions is wrong… should bone up on Calvin more. Unbelief is so deeply rooted in our hearts, and we are so inclined to it, that not without hard struggle is each one able to persuade himself of what all confess with the mouth: namely, that God is faithful. While we teach that faith ought to be certain and assured, we cannot imagine any certainty that is not tinged with doubt, or any assurance that is not assailed by some anxiety. On the other hand, we say that believers are in perpetual conflict with their own unbelief. • Inst. III.ii.15, 17. Sounds rather Arminian of him. Is certainty the enemy of faith? 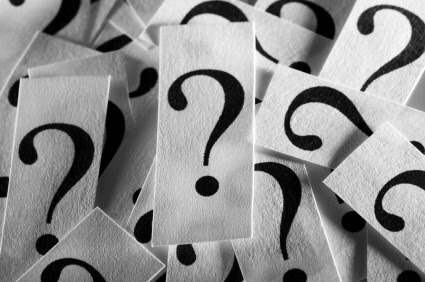 Does being certain mean that mystery is no longer allowed? 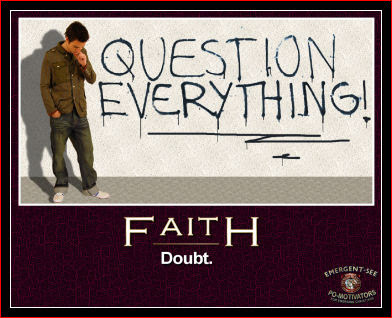 I run into those who seem to teach that we must be certain in all things of faith yet I just don’t see how that can be. I see that living in doubt leads one to fear, yet faith leads us to certainty and courage… so how does this all fit? I see this as a bit of a false dilemma made by those who cling to certainty and do not allow awe and mystery… or see that someone that simply trusts in God and does not need to know with certainty the answers… but knows that God IS the ANSWER. So I am certain that the bible is authoritative, not because I can prove it is infallible or inerrant, but that Jesus stated it was authoritative. Modernism seems to gut faith out of the bible and bring all of Heaven into the realm of man’s logic and reason. God is so far beyond us that to do so is to declare God is made in our image and results in God becoming vain human imagination. So certainty can have mystery in it as we grow. One can be certain as to what God has taught them, and yet acknowledge there is so much more (an infinite amount of knowledge) to learn. This take humility which some lack as they make human logic and reason their certainty and believe they have arrived. They reduce faith in Jesus to believes and base salvation not on Grace or that the “Just shall live by faith” to salvation by believes and living by logic and reason. You are currently browsing the archives for the certainty category.